A have a kelly green stole with gold trim makes for an excellent contrast and a great way to finish off your wardrobe. If you are preparing for your graduation, the pros over at Honors Graduation can help you put together the best attire to have you looking fantastic for your ceremony. Your graduation day is one you will remember forever, it is the final stepping stone to your schooling as you start in on a whole new adventure. Your family and friends will be there to cheer you on as you join your fellow graduates at your ceremony to accept your degree or diploma. Many graduating students have been known to decorate their wardrobe with different accessories for a number of reasons. The traditional graduation outfit, that is commonly required for students to wear in order to walk at their ceremony, consists of a graduation cap and gown. If you are looking for a way to help your club or team stand out while remaining unified at your ceremony, our graduation stoles are the perfect way to go. Here at Honors Graduation, in addition to our long list of accessories for graduation, we have convenient package deals including the essential items like your cap and gown. Here at Honors Graduation we have a number of various options to choose from to help you create the exact graduation stole you have in mind. We have eighteen colors to pick from for both the stoles main color as well as the trim. 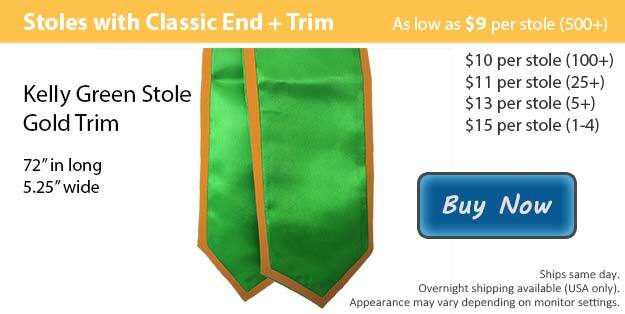 All of our stoles may also be purchased without the contrasting trim for a single colored option. We have two styles available, the classic cut and the angled finish both come in lengths on either 60 or 72 inches. Our stoles can also be customized with the image and or wording of your choice using embroidery.